According to HTC, the Desire 816 proved to be a popular device in the mid-range smartphone market. Now, only a bit longer than six months after its release, the Desire 820 is here to replace the 816 as HTC's new flagship of the Desire lineup. It's one of the first Android devices with a 64-bit ARMv8 SoC, and the first to adopt Qualcomm's Snapdragon 615. Below I've laid out all the specifications for the Desire 820. In many ways the Desire 820 is similar to its predecessor. The appearance is very similar, with colorful plastic backs and a front sporting HTC's Boomsound speakers on the top and bottom, with the front facing camera off to the left on the top bezel. The dimensions are also similar, with the 820 being ever so slightly taller and thinner than the 816. Keeping the same dimensions also allows the Desire 820 to retain the same 5.5" 1280x720 display and 9.88Whr internal battery. Where things get interesting is the SoC. For a long time the hardware platform for mid-range devices has remained the same. Qualcomm Snapdragon 400 with 4 x Cortex A7 cores and either 1.5GB and 2GB of RAM. Obviously there are cost and performance reasons for this. Snapdragon 200 was a big step down, and Snapdragon 600 and 800 were a big step up. With the launch of Snapdragon 410, 610, and 615 there's finally some more options for the mid-range market. HTC has chosen to adopt Qualcomm's Snapdragon 615 which sports 8 Cortex A53 cores in two clusters. One cluster of 4 cores is optimized for high performance, running at 1.5GHz, and the other is optimized for low power and runs at 1.0GHz. This is the first device to ship with Snapdragon 615, and one of the first 64-bit Android devices with the ARMv8 instruction set. However, support for 64-bit under Android won't exist until Android L ships later this year, and HTC is committing to updating the Desire 820 to Android L some time after it releases. For more information about Snapdragon 615 as well as Qualcomm's other Cortex A53 SoCs you can read the piece that Anand previously wrote about them. Beyond the SoC there are a few other improvements. The RAM has been bumped from 1.5GB in the Desire 816 to 2GB in the 820. The front facing camera also moves up a notch from 5MP to 8MP. In terms of connectivity the Desire 820 retains the same Qualcomm MDM9x25 modem solution but now includes 5GHz band support on 802.11n and aptX audio support over Bluetooth which is appreciated by users like myself who use Bluetooth headphones. While the Desire 820 won't win over buyers looking for the highest end smartphone, it definitely breaks new ground in the mid-range segment of the market. 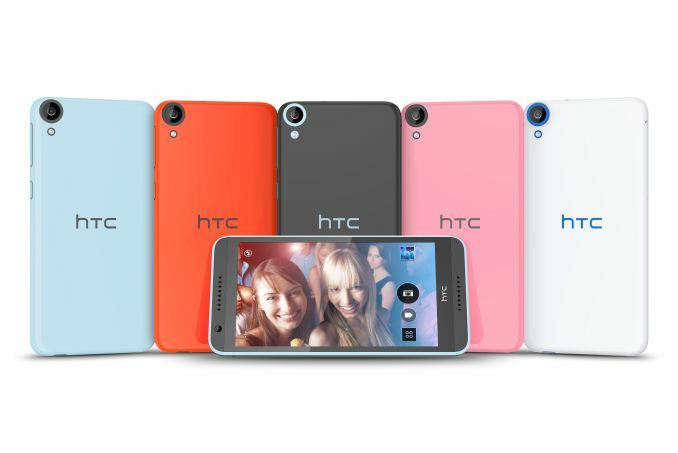 Like its predecessor, the Desire 820 comes in a wide variety of colors. Below is the entire list of color options, including whether they are a glossy or matte finish. 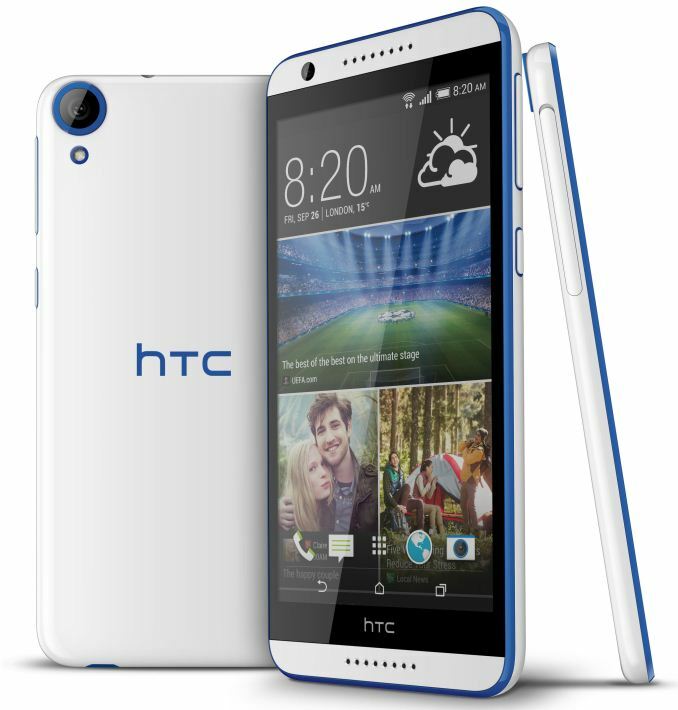 HTC plans to begin sales of the Desire 820 by the end of September, with the goal being to eventually have it at carriers and retailers worldwide. In certain markets, it will have dual Nano-SIM slots. Pricing is yet to be announced. So no details yet on the 615? Was curious if there is more than just clocks that differs between the 2 clusters. Noticed that the dimensions (H and W) are very close to the rumored dimensions for the iphone 5.5 (so too bulky compared to other 5.5 inch devices) at 157.7 x 78.74. Somehow HTC got the first dibs on both the 410 and 615 , made me remember that Qualcomm was an investor in HTC , not sure if they still are and how much of it they might own. I don't think the 615 will impress, it is a lower mid-range product. A53 is about as fast as A9, so at best it will be around the same performance as "el-cheapo" octa cores like the one mediatek has. Worst case, all 8 cores would not be usable by a single multithreaded process or load balancing would not work well due to the difference in clock speeds. That's not quite true ,yes the A53 should be slightly faster than the A9 and that also means that is plenty faster than A7. Plus the perf is not just the core. So this should be quite a big step vs A7 and does make it very interesting. After all most devices shipping now worldwide are A7 or A9 based.